Two sisters, Altagracia and Amada (Lorena Diaz and Wendy Mateo), create an altar for their recently deceased mother to celebrate her birthday, and her spirit rejoins them for 24 hours. Throughout the course of this day, they realize that their ‘Mami’ always had their back and that even in death … some things never change. The 35th Chicago Latino Film Festival (CLFF) will take place from March 28th - April 11th, 2019, and will feature over 100 feature-length and short films from Hispanic and Latino countries and the United States, primarily shown at AMC River East 21 (see website for other venues) All of the films will be shown in their original language, with English subtitles where appropriate. The audience will also have the opportunity to participate in discussions with visiting filmmakers after most of the screenings. For a PDF version of the full schedule, click here. In a Podtalk with Patrick McDonald of HollywoodChicago.com, writer/director/actor Wendy Mateo talks about “Good Mothers” and the inspiration for the short. 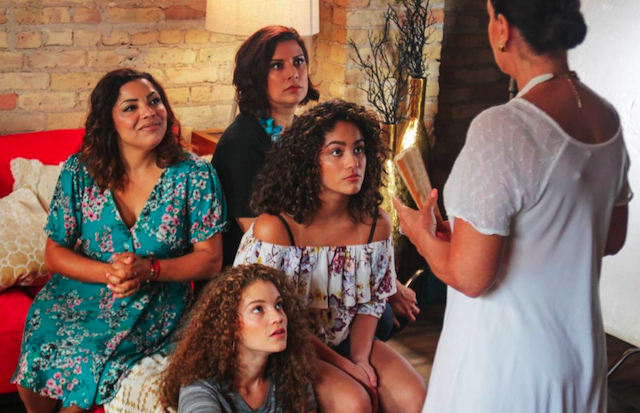 The 35th Chicago Latino Film Festival presents “Good Mothers” and “My Girlfriend’s Ghost” on Sunday, April 7th, 2019 (3:45pm), at AMC River East 21, 322 East Illinois Street, Chicago. Writer/director/actor Wendy Mateo will make an appearance on behalf of “Good Mothers.” For more general information on the 2019 CLFF, taking place through April 11th, click here. For information on “Not For Sale 2.0,” click here.